Themed centerpieces are great for holiday parties, but they take up valuable space on the table, leaving less room for food. A perfect solution to this dilemma is a floating centerpiece, which hangs above the table. 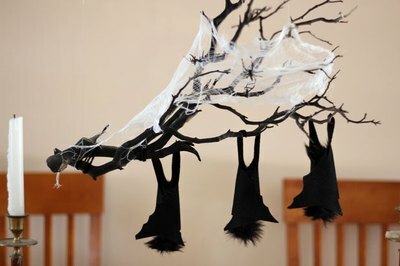 For this Halloween floating centerpiece, a gnarled branch with sleeping bats appears to be suspended in midair, adding to the decoration’s spook factor. 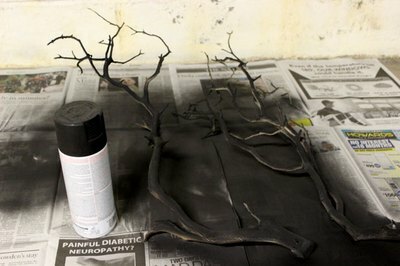 Apply black spray paint to a branch. Find a branch that is twisted and gnarled for an eerier effect. You can also use two smaller branches, like the ones in the photo. 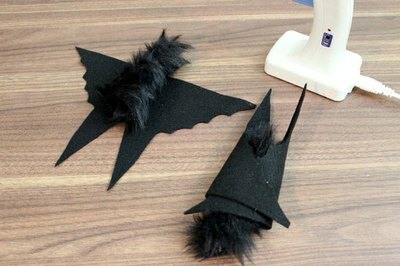 To make the bats that will be hanging from the branch, cut 8 ½” x 11” sheets of black felt in half. 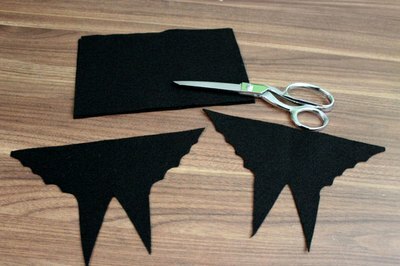 At the bottom of these felt pieces, cut out two inverted triangles for the legs, and then cut a scalloped edge from the legs to the top corners. 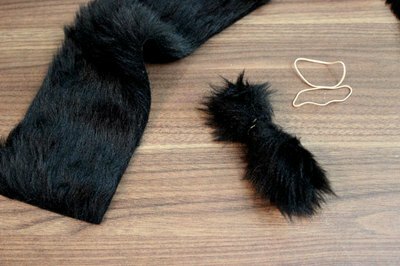 For the body of the bat, cut a 3” x 4” piece of black faux fur and roll it up lengthwise, securing it with a rubber band. 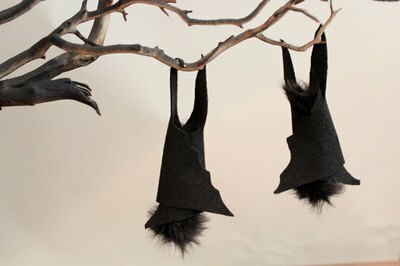 Place the furry body in the middle of the bat wings and fold the bat wings on top of each other. Glue the wings together with a dab of hot glue. You do not need to glue the body to the wings, as the wings, when rolled up, will hold the body. 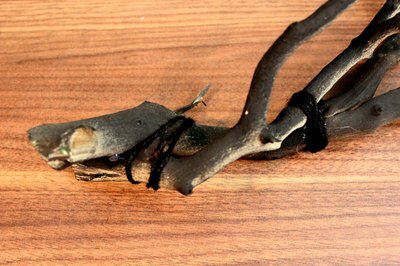 If you are working with two branches instead of one, tie them together with some string. 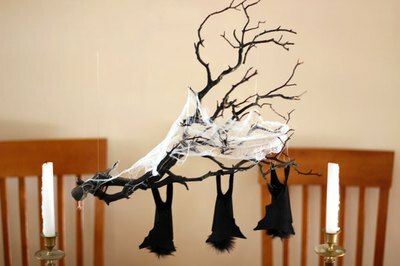 You can also add some hot glue between the branches to help hold them together. Hot glue the tips of the bat legs to the branch so the bats hang upside down. Arrange two to three bats in a row. 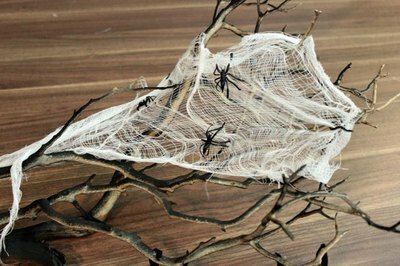 To make a cobweb, stretch a piece of cheesecloth in all directions. Allow parts of the cheesecloth to tear, so the web looks more authentic. Position it on the branch, snagging it on twigs to hold it in place. 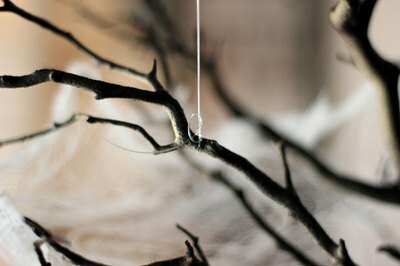 Hot glue a few plastic spiders to the cobweb. You will need two hooks on the ceiling to hang the branch above the table. 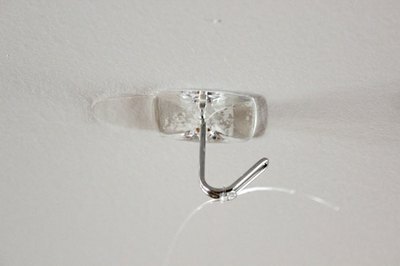 The best type of hook to use is one with a removable adhesive strip, like 3M Command Strips, so you can remove the hook later without damaging the paint. Position the two hooks directly above where the branch will hang, spacing the two hooks about a foot apart. Tie a piece of fishing line to each of the hooks. Tie the other end of the fishing line to the branch. It will help to have another person hold the branch in its desired place while you tie the fishing line to it. Do this for both pieces of fishing line. After the branch is floating in place, step back to see if you are happy with its height. Ideally, it should not be blocking sight lines if guests will be seated. Adjust the fishing line, if necessary, and cut off any excess.